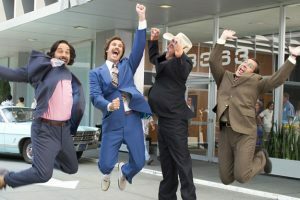 ‘Anchorman 2‘ will be released on December 20th, just in time for Christmas. Up till now, we have received two very funny teaser trailers with the iconic news team telling us to expect them this holiday season. Now we have actual movie footage that features the gang, plus new cast members including Kirsten Wiig and James Marsden. This looks amazingly funny. Look for this trailer in theaters this weekend in front of ‘World War Z‘. This entry was posted on Wednesday, June 19th, 2013 at 12:23 am	and is filed under Film, News. You can follow any responses to this entry through the RSS 2.0 feed. You can skip to the end and leave a response. Pinging is currently not allowed. « Neil Patrick Harris Heads to Broadway With ‘Hedwig and the Angry Inch’!! !